Bill pay kiosks are gaining popularity for multiple reasons. The freeing up of clerical staff and giving unbanked customers a method to pay a reoccurring bill are two of the leading reasons. A bill pay kiosk can be tailored to match how you want to handle payments. You can accept currency in either bills and/or coins or debit/credit cards. The next decision with hard currency is do you want to provide change. Many people are deploying kiosks which keep the change and credit the next billing cycle. You can lower your kiosk costs and take advantage of the float created by this method. The float can easily pay for the kiosk in a high traffic location. A check reader that reads and returns the check is another popular option. The return feature allows you to credit your account without having to handle the check. A scanner can also be used to read account information on bills to quickly pull up the correct account. The amount and size of the internal components of bill pay kiosks require the cabinet be of substantial size. Many kiosk designers get lazy with this type of cabinet and produce a “big box”. A properly designed large kiosk can still look attractive and be functional. You also want to make sure your kiosk is integrated with components that are backed with long warranty periods. There is nothing more frustrating than having a kiosk that doesn’t work due to substandard components. 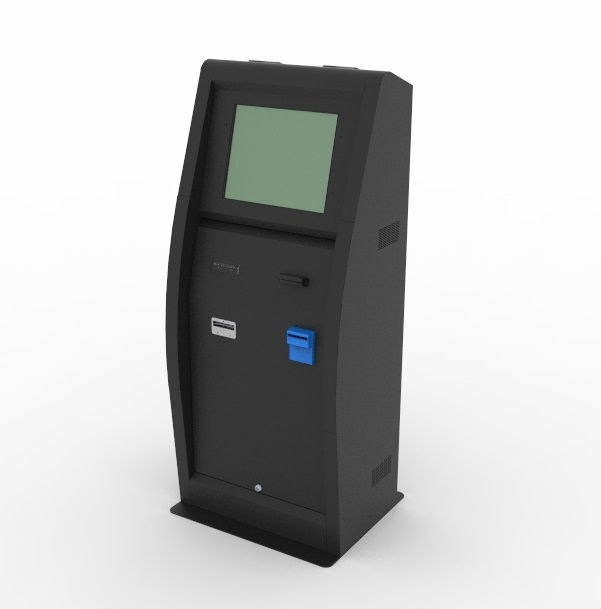 If you decide your business or government office could benefit from a bill pay kiosk, please check out our models at www.bruinkiosk.com. This entry was posted in Kiosk Application and tagged bill pay kiosk.